I used to be a school teacher, so this is the idea that came into my head for the St. Patrick's Day category for the MOCpages MocAthalon. 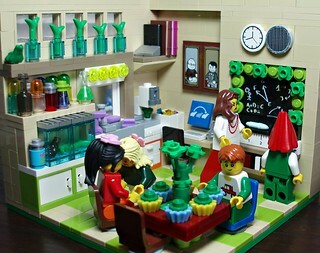 This is a science classroom, and the teacher decided to have a little St. Patrick's Day party for the students. She decorated around the blackboard, brought in a bouquet of green carnations, and served up some yummy, green-frosted cupcakes. Little Thomas got a bit too much into the spirit of the day, and decided to go around pinching everybody who wasn't wearing green. He didn't have the guts to pinch his teacher, but went for his classmate Emily instead. Now she's crying, her friend Jessica is trying to comfort her, Thomas is wearing the dunce's cap and standing in the corner, and Mathew thinks he is going to get to eat all the cupcakes by himself.